JustRetweet is THE retweet sharing site used by social media savvy, influential bloggers who support small businesses and collaborate with others. 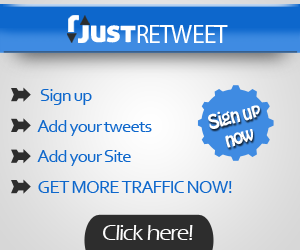 JustRetweet does all the works you need from your site weather you are looking to get more retweet from your site, more traffic and more followers. JustRetweet is a credit based Twitter sharing and Twitter following service. Join the site for free by authorizing the connection to your Twitter account and receive 100 credits just for joining. Users can earn additional credits by sharing each others content and following each other on Twitter. Once your account is connected, you can submit your content and offer credits to other users who retweet you or become your follower. For the posting guidelines, visit the How To page on the website, and for a demonstration watch this video. You can take advantage of our VIP packages and purchase credits for greater visibility and “featured user” spots (connect with Twitter to view our VIP package pricing). Visit our Press page to see a list of testimonials from satisfied JustRetweet users and customers.